Plastic box for Raspberry Pi. 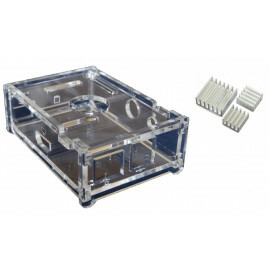 You can protect it with one of these snazzy plastic enclosures .These cases protect the Raspberry Pi from things like rogue wires that might short it out while still allowing full access to the board! Simply snap the RPi into the bottom half of the enclosure, then snap the two sides together. Box needs you to assemble it, but its very simple, and you can tear off the plastic protective film on the surface.